Invigorate your space with the Madison Park Essentials Joella 24 Piece Room in a Bag. The lavish tufted details flaunted on the comforter, shams, and window valances deliver an elegant statement in bold, natural hues. A large border frames the luxurious comforter, adding charm and dimension to the bedding set. Matching shams echo the motif seen on top of the bed, creating an elegant look in your space. An included microfiber sheet set and bed skirt complements the bedding collection and offers exceptional comfort and style. Two Euro shams and four embroidered decorative pillows help to complete the bedding set, giving it a finished look. 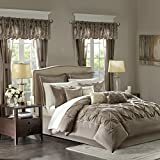 Accompanying this bedroom set are four window panels with four tie backs to keep curtains drawn open, while two tufted valances provide the finishing touches to your bedroom.